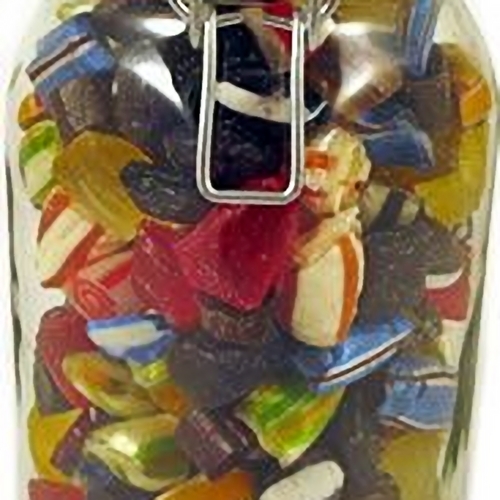 Handmade Winter Mixture Kilner Jar - A stunning thick glass large kilner jar filled to the brim with the most refreshing, de-congestingly delicious boiled sweets - perfect for sucking in the winter months. It's a big jar and makes such a lovely, traditional gift for someone really special (or for yourself if you're all bunged up with a cold). And the best bit? Well, once you've gobbled all the sweets, and you're feeling fresh as a daisy again, you can use the jar again and again and again - either with more sweets, coffee, sugar, spices, pasta, lentils, bath salts, screws, marbles, biscuits, ear buds.... I could go on for some time. It'll look stunning on your kitchen shelf! We choose the sweets to make sure that there is a really good selection of different colours and flavours (from spearmint to clove...mmmmm spicy!) - and we cram in as many as we can. Officially we say that the sweets weigh about 1.1kg - but really they may weigh a fair bit more (depending on the selection)! Each large kilner jar measures 21.5cm x 10cm x 10cm (that's 8.5in x 4.0in x 4.0in) and weighs 2.0kg in total (including the jar). They're brilliant!